Generations Connected is Community Care of Rutherford County’s on site Daycare and Preschool program. We offer services to the community at large, employee’s children and resident family members. We are committed to caring for our children in a safe and nurturing environment. Our professional curriculum enables each child to thrive and grow, building self-esteem and character development. Our caring and dedicated teachers give children the guidance and freedom to construct knowledge in ways that are meaningful to them. 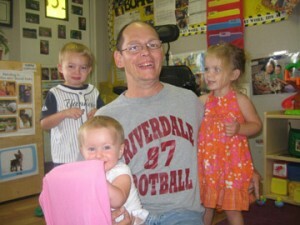 We serve children ages 6 weeks to 5 years from 6am to 6pm. Our home-like environment allows children to explore and discover, encouraging them to become creative problem solvers, life long learners and interested individuals. Generations Connected fosters interactions between residents of CCRC and our children, developing a bond between generations. 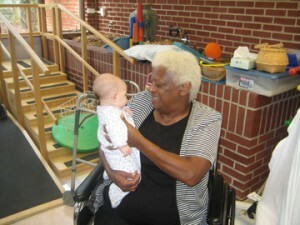 The residents and children come together on a regular basis for intergenerational activities. 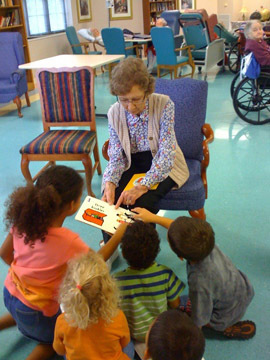 These meaningful interactions include arts and crafts, singing, reading, dancing and story telling. In a 2005 study, preschoolers who had regular contact with elders were eleven months ahead of children in standard daycare in their abilities to name emotions, work cooperatively, and participate in social activities. They also had better language skills and manners. As for the adults, it offers an opportunity to share past experiences and be a positive role model for the young. 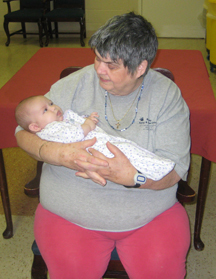 Relationship building is just one benefit of an intergenerational program, another is care and love. Every child craves adult attention; here there is abundance! Many residents enjoy rocking and feeding the infants. This often brings back memories of child rearing and offers a great deal of joy for both the resident and the baby. The residents of CCRC also share their legacies with the children. Many residents use their past accomplishments to mentor our children. A retired school teacher animatedly reads to our children. Ladies who love to cook will share recipes. Men who worked on cars, paint and race box cars with our preschoolers. Many residents have something to offer and these interactions give them an opportunity to share their wisdom. Our “Turtle Bus” is a six seat buggy that Generations Connected uses to transport our younger children. Residents see the buggy coming and immediately light up! The buggy was purchased through a Junior League of Murfreesboro Community Partnership grant in 2008. Located in a pristine twenty two acre country setting, Generations Connected is easily accessible to a vegetable garden and fruit orchard. The children have valuable, hands on learning experiences with nature. This year in our garden spot, the children grew watermelons, cantaloupes, and tomatoes. We are conveniently located and offer affordable tuition prices. We offer discounts to employees of Rutherford County. Generations Connected also participates in the Tennessee Daycare Certificate Program. For more information, or to take a tour please e-mail Lauren Andru at landru@rutherfordcountytn.gov or call 615-217-7133. A segment recently aired on ABC gives a great example of the benefits intergenerational interaction can have on our elders and our children. The video is located below.